Das Duschbad befindet sich im Erdgeschoss und ist mit einer Massagedusche ausgestattet. Toilette, Waschbecken und beheizte Handtuchhalter. On our arrival Gordon was welcoming and friendly. The gite is positioned on a sharp bend which makes access tricky so you have to be quick in and out. Although we were aware of the steps down to the gite from the car parking area, this was made more difficult by the steps being overgrown and generally neglected. The gite itself is spacious but showing signs of its age especially in the kitchen and bathroom. For example, the toaster had an English 3 point plug (unusable), the fridge door did not seal and the kettle had to be boiled on the hob and lit with a match. Essential items that are normally found in the kitchen were not to be had i.e. bin liners, j cloth etc. Our biggest disappointment was the misleading information about access to the river at the bottom of the garden. Before we booked in February 2017 we specifically asked about fishing from here and were told it was possible. There is no way that you could even get through the undergrowth at the bottom of the garden, let alone fish. Strangely enough these details have been slightly changed recently! "Dear Sue, thanks you for your review. I would like to reply to some of your comments. It is clearly stated in our guest information book that any issues are raised immediately, so they can be dealt with. I do not understand your comments regarding the steps, as the garden is regularly maintained and the steps are kept clear, also the kettle and toaster are brand new (hardly showing signs of age). As I pointed out on your arrival, there is an adaptor in the kitchen draw for your uk appliances and also the toaster. I have checked the fridge door and there isn't a problem with it, in fact its been used since your departure with no complaints and yes, you do need to light the gas hob with a match........... Essential items - there was a bin liner provided in the bin on your arrival along with eco friendly, washing up liquid, laundry detergent, multi surface spray, micro pore cloth, washing up sponge and toilet rolls, not to mention tea, coffee, sugar, milk, bottle of mineral water, bottle of wine, cheese, bread and matches ( all of which you failed to mention ) Disappointed. Finally, I would like to address the access to the river. As I explained to Cliff on your arrival, because of recent storms, access to the river from the garden was restricted for safety reasons. But as I pointed out, there is another route to the river, less than a 5 minutes walk. What you also failed to mention was the morning I spent driving Cliff around, showing him a variety of fishing areas along the river. Disappointed. Kind Regards, Gordon"
Gordon and Marie were marvellous hosts. They respected our privacy, gave us good information on the area, and were kind and friendly. When my husband got an infected bite on his leg and had to go to hospital; when I realised I had forgotten my painkillers and needed to acquire some more; they were really supportive and helpful. The area is marvellous - so much to visit, and a man-made lake close by for watersports and swimming. The cottage has a file for places to go - so I don't need to explain everthing - but do not miss HAUTEFORT castle and village. The cottage is pleasant. It is clean and bright, and the setting is lovely. All we heard was leaves ruslting, birds, cows mooing in the distance and we saw trees, trees and more trees waving in the breeze. The road behind the cottage is very quiet, but you need to be quick out of the driveway as it is a heck of a slope and they do hurtle around the corner. We gave one women a bit of a nasty shock one day when we got stuck on the breast of the entrance!! There are cons to this place. Some are clear in the description - it is not very accessible. The steps from the parking area are steep and difficult, and the garden is terraced. We knew this when we booked - no bother then! By the time we arrived, I was on a walking stick 3 months post back operation and it was no joke. So take Gordon's warning on this. The parking is said to be private - but this does not mean just for guests. We were sharing with the hosts, so we did not get any shade for the car and it was like an oven every day. It is also a three-point-turn job unless you back in down the steep curved gravel drive - which we never managed safely. The river is at the bottom of the garden, and fishing is stated in the advert, but it is not accessible from the cottage, and the walk along the roadside was a bit dodgy with no footpath,and hairpin bends downhill, so my husband's fishing kit did not get aired. The local trout farm allows fishing but charges by the fish weight - expensive if you are someone throwing them back, but you can eat them. We were there when it was very hot - up to 39 C - but there were no fans. We had to keep the doors and windows open and the beasties ate my husband alive because there are no nets either. We bought a plug-in insecticide that you can use with open windows, so that helped. Plunge pool is a paddling pool. The filter does not clear the water efficiently, so we stopped using it after the first 4 days. Dear Gaynor, thank you for the 4* rating, just a few points I would like to comment on. We do our utmost to accommodate our guests needs, during their stay here (as you mentioned in your review). It is clearly stated in our guest information book, that any concerns are raised immediately, so they can be dealt with and resolved, i.e. a fan is available if you would have only asked. No one has ever complained about being bitten, but as you said to me, Mark gets bitten wherever he goes. I would have also dealt with your concerns regarding the pool immediately. I must point out that the pool size is actually described on the web site. It contains 4,400 litres of water, hardly a paddling pool. Regarding the river access from the garden, I explained to Mark on arrival, the garden access was blocked due to recent storms and fallen trees, but an alternative route to the river was shown and is less than a 5minute walk. Top grade Gite. Privacy, peace and wildlife. Las Chaumas is a beautiful Gite. We both loved staying. The descriptions are accurate, Gordon and Marie are excellent and experienced hosts. 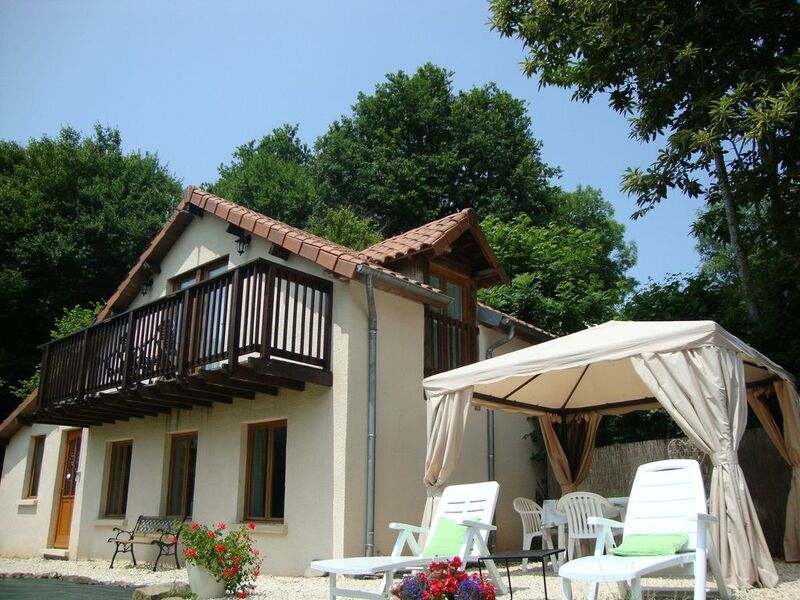 The Gite is clean and very comfortable to live in with all the facilities of home. Evenings were spent sitting outside watching the wildlife go by. Most days too actually. What we saw during our stay at Las Chaumas. Golden Oriole, Black Caps, Chiff Chaff, Whitethroat, Black Kites, Redback Shrike, Tawney Owl. Common and Green Lizards, Purple Emperor Butterfly, Marbled White, White Admiral. Payzac is a lovely place and has a small and very well stocked supermarket at the top of town. The people we met and spoke with were all very friendly and helpful. We loved it. We arrived at approx 8pm to be met by Marie who showed us around and welcomed us with a bottle of wine, cheese, milk, tea coffee and bottled water. How lovely this was after a long journey. As we thought we would to the village restaurant for a meal she told us the locals were having a molues and frites evening in the village which really appealed. Very kindly she drove us there (5 mins in car ). This was only the start of excellent customer service during our weeks stay. The gite was clean very well equipped and so homely. Beautiful, peaceful rural setting for those wanting to completely relax and unwind. The owners Gordon and Marie had provided us with great information on local attractions and we were not disappointed. Only problem being that a week is not enough to see all the beautiful places in that area of France. Would definitely recommend this property to friends and family and would love to revisit. Thank you so much for making our week truly a lovely experience. Linda and Steve. Delightful guests, a real pleasure to have met you both. Glad you enjoyed your stay. Am nahe gelegenen See Rouffiac (7 Autominuten), Schwimmen und zusätzlichen Wassersportarten wie Tele Ski, Kanus und Pedalos stehen Ihnen ein schöner Sandstrand, eine Bar und ein Restaurant zur Verfügung. Das Anwesen befindet sich eine Autostunde von Limoges Flughafen mit günstigen Flügen, die mit RyanAir von East Midlands, Stansted, Liverpool und Nottingham Flughäfen nach Limoges täglich. Flybe fliegt von Southampton nach Limoges Airport. Das Anwesen ist ca. 8 Stunden Fahrt von allen großen französischen Fährhäfen entfernt. Das Ferienhaus liegt nur wenige Gehminuten entfernt ist das historische Dorf Payzac. 5 Minuten zum Fluss Auvezere. Das mittelalterliche Dorf Segur le Chateau ist 15 Autominuten entfernt. Das herrliche "Chateau Hautefort" ist 20 Autominuten entfernt. Eine Vielzahl von großen Supermärkten, Restaurants und Geschäften finden Sie in St. Yrieix La Perche (20 Minuten mit dem Auto). Die Städte Limoges und Perigueux sind eine Stunde entfernt. Hochzeitslocations von Chateau Durantie und d'Essendieras sind nur 15 Autominuten entfernt. Es gibt viele Aktivitäten in der Umgebung, einschließlich: Reiten, Kanufahren, Radfahren, Wandern, Fluss und See Angeln. Es gibt auch eine Reihe von Golfplätzen in der Gegend zu finden, die meisten innerhalb einer Stunde Fahrt. Pompadour mit seinem prächtigen Schloss ist eine 15-minütige Fahrt. Es ist auch die Heimat der nationalen Zentrum für Pferde einschließlich einer nationalen Gestüt, Springreiten, Dressur und Pferderennen auf seiner hervorragenden Rennstrecke. Es gibt zahlreiche Restaurants in der Gegend, die die Freuden der Region - berühmt für seine Ente produzieren, Foie Gras und Trüffeln. Booking Notes: A 25% deposit is required at the time of booking, this is non returnable. The balance of the rental amount is due 6 weeks prior to the commencement of the holiday. We also require a refundable security/key deposit of £80 payable with the final balance, which will be returned to you within 2 weeks of your departure. Changeover Day: Changeover day is Saturday - but we are flexible outside of July and August. All bookings - Arrival time 4pm. Departure time 10am. Notes on prices: Prices are per week in UK Pounds.